Illinois has not yet passed a state budget for higher education, and schools like Chicago State have been left in the lurch. According to the Chicago Tribune, Chicago State will not be able to pay employees after April. Similarly, the University of Illinois, Urbana-Champaign, is pleading poverty. Unlike Chicago State, the University has the money to withstand this crisis. Instead, it is trying to balance the budget on the backs of graduate employees, non-tenure track faculty, and undergraduates. As Grievance Officer for the Graduate Employees’ Organization (GEO), I have heard from graduate employees across campus who have been told to look outside their department for funding or that the funding will simply be unavailable next year. Those graduate employees left will be left with more work as class sizes increase, meaning that educational quality will go down. But it doesn’t have to be this way. In February 2015, the Daily Illini published a story about the impact of Governor Rauner’s proposed budget on UIUC. The story featured a graph that showed a stark decline in University funding. 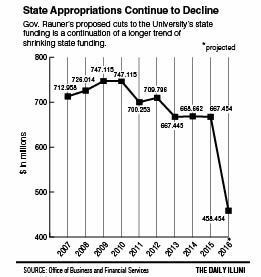 From this graph, one would assume that the budget has been devastated by cuts to state appropriations. However, this graph, like many University financial statements, is misleading. State appropriations, if they are passed soon, would be lower than in past years, but the difference is not as stark as the University claims. Using 2015 numbers, state appropriations account for about 1/3 of the budget. However, the University also has income from another source: tuition. While state appropriations have dropped, tuition has steadily risen. Between the 2006- 2007 and 2013-2014 Academic Years, in-state tuition rose from $7,708 for incoming freshmen to $11,834, according to the University’s own reports. Tuition for non-resident students rose at similar rate, from $21,794 to an alarming $26,216 during the same period. For the 2015-2016 Academic year, the resident base tuition is $12,036 and non-resident base tuition is $27,196; the international student base is $28,026. Tuition for international and out-of-state students is so high that even though non-resident students make up about 26% of the student population, they contribute about 43% of the tuition income from undergrads. 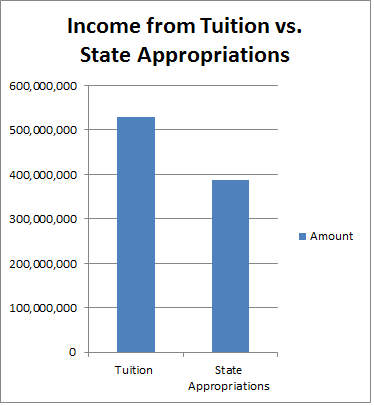 In fact, the University makes more from tuition than it gets from appropriations. According to the Daily Illini, the proposed state appropriation for the Urbana campus for the 2015-2016 academic year was $387 million; I estimate the income from undergraduate tuition as $529,127,608. This does exclude financial aid; but most forms of aid, like grants, outside scholarships, and loans, will produce tuition income; and the University reports an expenditure of only $241,000 in student financial aid for the 2015 fiscal year (not including financial aid administration). And my calculation, based on the resident and non-resident ­base tuition and the student population data for undergraduates, excludes tuition from professional students and does not account for departments that charge more than the base. Thus, the total amount may be even higher. Yet, despite the amount brought in via tuition, UIUC is pleading poverty. It is hard to tell where exactly the money is going. The University audits report combined financial data for all three campuses (Chicago, Urbana, and Springfield), making the data useless for determining how much was spent on any individual campus. The budgets are divided by campus, making it a bit easier. However, the budgets report what the University plans to spend, not what was actually spent, saved, or in excess. And some categories, like “auxiliary expenditures” are loosely defined, so it is unclear what money goes where beyond the broad categories. The budget for the UIUC campus in 2015 was about $2 billion. However, Governor Rauner and the State Senate are only part of the story. The University has also made a series of bad financial decisions. The University signed incoming football coach Lovie Smith for $21 million over the next six years, plus $4 million per year for his staff. In 2014, UIUC was paying just over $3 million to former athletic employees, meaning that the Athletic Department was running at a deficit of $6 million at that time, according to the Washington Post. According to a USA Today study of NCAA athletic departments, UIUC athletics is running at a deficit of $3 million currently. UIUC ranked fourth in the nation in terms of severance pay to former athletic employees, according to the Washington Post. In addition to bad decisions in the Athletics Department, UIUC has had a series of mishaps with administrators, who may also receive severance pay. The University should be ashamed of forcing their budgetary problems onto undergraduates, graduate students, and instructors. The lifeblood of the University should not bear the burden of the poor decision-making of UIUC administration and athletics. Despite the University’s claims that there is no money to go around, there is. The active endowment (what the University currently has and is investing) is $2.39 billion, and the total endowment (including planned gifts) is about 3.3 billion. According to the National Association of College and University Business Officers and Commonfund Institute, UIUC ranks 37th in the nation in terms of the size of its active endowment. Yet the University claims that it cannot afford to pay graduate employees who previously had appointments, and overworks current graduate employees to cut down costs. If the University spent the recommended 8% of its endowment, that would cover nearly half of the planned contribution from state appropriations. The University should use some of the endowment to weather the storm, but instead they’re claiming that they must slash positions and funding, compromising the quality of undergraduate and graduate education. About 43% of the bargaining unit makes a living wage, based on the MIT living wage calculator. Graduate employees protected under the GEO’s collective bargaining agreement work between 25% Full-time equivalency (FTE) and 67% FTE. A 50% appointment would be 20 hours a week and considered “full-time” for most graduate employees, but about 25% of the bargaining unit does not have a 50% appointment, meaning that they may have to work a second job or take loans to pay their expenses. If the University devoted just 3% of its reported $2 billion dollar budget to graduate employees, instead of 2%, then all 2755 members of the Graduate Employees Organization could have appointments for an entire year at the living wage for Champaign County. Instead, most graduate employees are not employed over the summer, meaning they have to take out loans or seek employment elsewhere. The University has the money, but has refused to allocate it towards bettering public education. Instead, it claims that it must cut costs on the backs of employees who make the University what it is: a quality institution of higher education. The University needs to release audits for the UIUC campus, rather than hiding behind UIC and UIS. As a public institution, the University needs to remember that its duty is to the public. Everyone at UIUC has an interest in the state budget being passed; instead of forcing students to bear the brunt of budget cuts, we should be working together to get the budget passed and enlarged. Undergraduates are not a budget solution either. While the University has created a situation where it can survive without state funding, the University needs to re-assess its purpose. The State of Illinois has forgotten its promises to higher education. It is time to hold the state accountable for its failure to promote higher education, but we must also hold the University accountable for obfuscating the budget and balancing the budget on the backs of students. Mary Grace Hébert is a PhD Student in the Department of Communication at UIUC. She serves as the Grievance Officer for the Graduate Employees Organization.